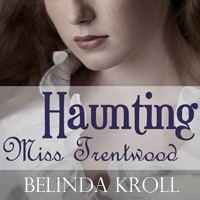 May 30, 2012 - PRLog -- Columbus, OH author and resident Belinda Kroll has re-released her sophomore book, "Haunting Miss Trentwood," a 254-page novel, as an audio book. "Haunting Miss Trentwood" is an historical romance featuring Mary Trentwood, a young spinster being haunted by her overprotective father. What starts as a spooky Gothic tale lightens to an amusing romance as father, daughter, new beau, and old beau race to discover the identity of a local blackmailer. "Haunting Miss Trentwood," having sold consistently since its original paperback and eBook release in October 2010, will be available as an audio book in mid-June 2012 at Audible.com, Amazon.com, and iTunes. A synopsis of "Haunting Miss Trentwood" is available at the author's website, http://worderella.com/fiction/haunting-miss-trentwood/. The final release price of the book will be between $15 and $20 USD. ACX is a marketplace where professional authors, agents, publishers and any other Rights Holders can post audiobook rights to both new frontlist titles and to backlist titles that were never published as audiobooks. At ACX, those rights get matched with Producers, which include audiobook publishers, narrators, engineers, and recording studios. The result: More audiobooks will be made. A team of executives at Audible created ACX, and Audible.com, is a subsidiary of Amazon.com. All titles made into audiobooks on ACX will be sold by three of the leading retailers of digital content: Audible.com, Amazon.com, and iTunes (where Audible is the exclusive audiobook supplier). I combine my nerd-love of Victorian history with my passion for storytelling in my quirky Victorian romances. I dabble in contemporary fiction via my short stories. I’m a writer, born and raised in Ohio, and proud of it. I wrote my first “novel” in fourth grade, and my second in sixth grade. That second novel became my high school senior thesis which I published as the first edition of Catching the Rose. I confused everyone who knew me as the art-English-history student in high school by getting my undergrad degree in Computer Software Engineering with a minor in English. I also have a Masters of Science in Interaction Design. Along the way, I published Haunting Miss Trentwood and picked up swing dancing, which exploded into lindy hop, charleston, balboa, and blues. It was in my masters program where I realized the power of the nerd. My nerd made me interesting and fun. My nerd gave me a passion and a voice to speak about it. My nerd gets excited with other nerds about their nerdy passions like dance technique, historical facts, the craft of fiction, food adventures, and more. My nerd wants to meet your nerd so we can nerd out together.